Search for Valerica in the Soul Cairn. Upon your arrival in the Soul Cairn, follow your quest marker to the Boneyard and find Serana's mother Valerica standing near the entrance. While you are able to speak with her, she cannot be reached due to an invisible barrier. During the course of interacting with her, she will reveal that the barrier can only be removed by defeating the three Boneyard Keepers. The Keepers each live in separate towers, apart from the main Boneyard. The quest markers will lead to all three. The locations of the Keepers are relatively far apart. Because of this it is recommended that you have some means of quick transportation. Arvak will do nicely for this purpose. Each of the Keepers will have 1-4 minions (bonemen, mistmen or wrathmen) that will attack you, usually ahead of your encountering the Keeper. Sadly you can't pick up any of their armor that they drop, only their weapons, which are mostly of poor quality. The keepers themselves may prove to be quite a challenge to lower level players. One possible strategy is to use Unrelenting Force to blast them off the edge of the towers. Once the final Keeper is defeated, the quest will update and you will need to return to Valerica. She will then lead you into the Boneyard. Once inside the Boneyard, you will have to "slay" Durnehviir. There will also be numerous skeletons in combat, but they will die along with him. Let Valerica and Serana handle any of the minions while you focus on Durnehviir. Once he has been defeated, take the Elder Scroll, and speak to Valerica. If you are not a vampire, and allowed Serana to partially soul trap you in order to enter the Soul Cairn, Valerica will instruct you on how to retrieve your soul from a Soul Essence Gem located at an offering altar not far away. The miscellaneous objective "Retrieve the Soul Essence Gem" will lead you to it. Once you leave the Boneyard, Durnehviir will rematerialize and speak to you, starting his quest. If you tell him you have more pressing matters to attend to, his quest will not begin and you will need to return to him at a later time to initiate it. Afterwards, you may proceed to the offering altar to retrieve your soul if necessary, then travel back to the portal and complete the quest. The soul essence gem can be retrieved before talking to Valerica. If you do so, she won't talk about it. After you kill Durnehviir, there will be a prompt to search him but it is impossible to do so. Sometimes after you retrieve your fragmented soul, the stairs leading back to Volkihar Castle on the return trip will be unusable and be part pixelated and you will walk right through them. Re-load a previous save to correct. ? If you try to ride through the portal on the horse, Arvak, it will make you dismount. After you dismount it can cause your screen to turn black. Nothing happens after that, besides music and seeing a black screen. The way to get out of it is to turn off your game, seeing as you cannot access the start menu. ? Immediately upon leaving the Boneyard, it is possible to attack Durnehviir before he begins dialogue with you. This may make him hostile or at least prevent dialogue from occurring, making it impossible to obtain the "Summon Durnehviir" shout and by extension the "Soul Tear" shout. Valerica will sometimes not move when returning to her after killing the Boneyard Keepers. Enter the Boneyard and defeat Durnehviir, press the "~" key to open console, and type tcl then press enter. You should be able to fly and move through objects; go to the Elder Scroll case and enter the container to pick up the scroll. This will trigger the next stage of the quest, and solve the bug without creating the later bug in the quest Unseen Visions. Another way of solving this is to go into Boneyard and type prid xx003B8E first and then moveto player . This will teleport Valerica next to you, and she will resume to her correct pathing. As for Serana, just repeat the process but type Prid xx002B74 instead. Valerica will not give the dialogue to help you find the soul essence gem if you have already slain one or more of the keepers before talking to her. It is in a building near the westernmost keeper, the one that uses a one-handed weapon and a shield. 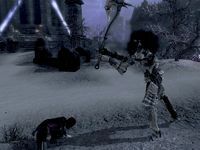 The mission can break if you go after the pages of Jiub's Opus and Arvak's Skull causing Serana to disappear and prevent you from furthering and completing the Dawnguard quest line. 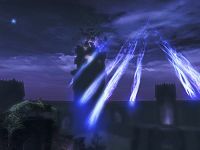 It is advised to complete the main quests in the Soul Cairn before going after them or walking everywhere in there so as not to lose Serana. To get Serana back, simply go back through the portal to Volkihar. She should appear with you again, and you can then return to the Soul Cairn. 10 Serana and I have entered the Soul Cairn in pursuit of her estranged mother, Valerica, and the Elder Scroll she took when she fled Castle Volkihar. 30 Serana and I have located Valerica imprisoned within a massive ruin. When confronted by us, Valerica revealed that Serana's blood is an integral part of the Tyranny of the Sun. After the reconciliation between the two of them, Valerica confessed to having the Elder Scroll hidden in her ramshackle living space. In order to free her from the prison, Serana and I will have to locate and slay the Keepers who maintain the barrier around the ruins. 50 Serana and I have slain all three of the Keepers and the barrier around Valerica's prison has faded. We rejoined Valerica, who has agreed to take us to the location where the Elder Scroll is hidden. 80 As Valerica was leading us to the Elder Scroll, an ancient dragon named Durnehviir swooped into the ruins and attacked. It proved to be a challenging battle, but we've emerged unscathed. 200 Finishes quest We've exited the Soul Cairn with the Elder Scroll in hand. Serana's mother, Valerica, is unwilling to return with us to Tamriel until we've dealt with her husband and thwarted the Tyranny of the Sun. Finishes quest We've exited the Soul Cairn with the Elder Scroll in hand. Serana's mother, Valerica, is unwilling to return with us to Tamriel until we've dealt with her husband and completed the Tyranny of the Sun using our own methods. DLC1VQ05: 0, 20, 28, 29. On the PC, it is possible to use the console to advance through the quest by entering setstage DLC1VQ05 stage, where stage is the number of the stage you wish to complete. It is not possible to un-complete (i.e. go back) quest stages, but it is possible to clear all stages of the quest using resetquest DLC1VQ05. This page was last modified on 25 April 2017, at 18:37.